Friends, it’s Friday. This week I baked breakfast treats for an office of 55 people. I taught a Thai cooking class to a super fun group of 10 and, the next night, taught a farmers’ market special class to another super fun group of 11. I’m a little tired. My kitchen is a little messy. But who cares? It’s Friday and the sun is shining and we have a party to go to tonight and another to go to tomorrow night and I imagine you might have plans as well. Need some nuts? I make all kinds of cocktail nuts. I make them to give as gifts around the holidays, I make them for parties that I cater, I make them so that I always have a nibble on hand when unexpected dinner guests come by. I do really love the smoky cashews and still make them often but truthfully, they can be a bit of a struggle. The topping doesn’t stick as well to the nuts as I would like it to. Which is why I am really digging this recipe. These beauties get perfectly coated, perfect crisp. Not too sweet, salty and quite spicy. You should probably make some this weekend. Winner of the Patricia Wells book will be announced on Monday along with one last giveaway. Oh! And many of you have asked about the three Indian cookbooks I mentioned in that post. One is a gorgeous book from the Cinnamon Club – an amazing restaurant near Victoria Station in London. The food is very fine and the recipes are a little intense. Not really every night type of cooking but amazing nonetheless. That one you can find on Amazon. The other two are both from Rasa – a much more casual but, in my mind, even more delicious place where I first learned about the glory that is South Indian food. I have cooked many times from both books and they are terrific. The New Tastes of India and Fresh Flavors of India. Also available on Amazon. I don’t make any money by directing you to them – they are just the easiest source for books that might be hard to find in this country. You can, of course, play around with the nuts you use in the mix and you can also halve the recipe. If you don’t love spice, I would cut the amount of cayenne in half. I may have thrown in a pinch of smoked paprika as well. Preheat the oven to 350ºF. 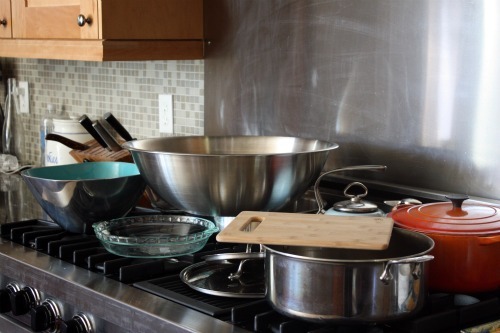 Line a baking sheet with parchment paper, a non-stick liner, or foil. Pick the leaves from the thyme and rosemary sprigs, and chop the leaves coarsely. In a mixing bowl, combine the thyme, rosemary, corn syrup, cayenne pepper, salt, and black pepper, and mix well. Add all the nuts and mix thoroughly with your hands or a wooden spoon. Spread the nuts evenly on the prepared baking sheet. Roast, stirring a few times with a heatproof spatula or a wood spoon to ensure the nuts color evenly, until they are fragrant and a rich brown, about 15 minutes. Let cool completely. The nuts will keep in an airtight container in a cool, dry place for up to 2 weeks. You’ve been busy! Enjoy your weekend! 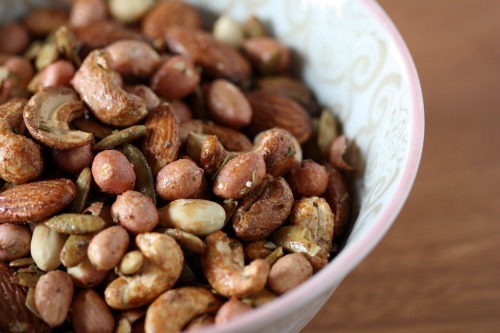 Nuts always make a great snack. I will most definitely be making these this weekend…thanks! A weekend of parties and sunshine sounds lovely. Have fun! I am sitting here with my soon to drink cocktail (it’s 5 o’clock somewhere….) eating cashews, looking at my stove w/ the stainless steel bowl, Le Creuset Dutch oven, Pyrex glass pie dish, all waiting to be put away. What time are you coming over for drinks? Girl, that’s nothing! I had 12 people over on Saturday night and I didn’t do dishes until Tuesday. Yes, I’m ashamed. But nuts! I love the sound of these – spicy and sweet and flavoured with herbs? Sounds delicious. I love roasted nuts! I have a recipe very similar to this, but it doesn’t have corn syrup. I think the addition of the sweet with the spicy is great. Thanks for sharing this recipe; I’m going to have to try it out! Just made them…they are cooking and are making the house smell wonderful. I now definitely see why you have a moratorium on cooking going on. But apparently that doesn’t apply to cocktail nuts…which works for me! These look like the perfect snack to have on hand! And thanks so much for the cookbook info…definitely going to order them. What a busy week you had. What a perfect snack for the week-end. These look yummy, I wish I had some right now! I think that you should do a post on how you can do so much in a week. The thought of teaching classes, throwing dinner parties and taking care of two children boggles my mind. I would love to hear how you plan, organize, etc. You are one busy mama! Look at you go! So I’ve been thinking about you lately…coming to Seattle tomorrow night for a hot minute (this time around: too short!) but will be back VERY soon and we must get together. Miss you; love how you’re taking off in your new business ventures. xoxox! Love your stove! 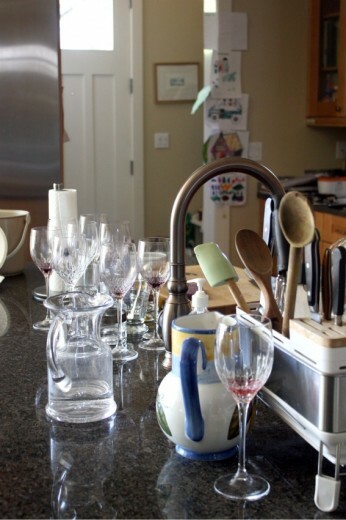 And that small glimpse into your kitchen. This looks delicious! 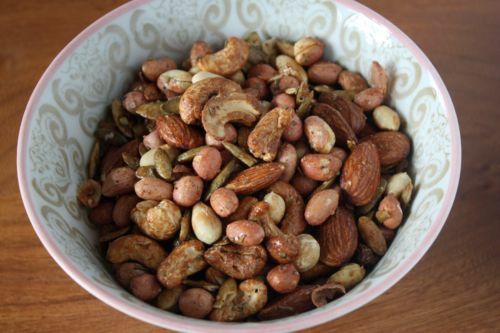 I’ve just recently experimented with teriyaki almonds and found roasted nuts to be a great flavorful snack to keep in the car! We have an upcoming road trip, so I’m glad to have found this recipe! Those sound fantastic! Never apologize for amazon, you can truly find everything on there, usually for cheaper than anywhere non-local! I love making cocktail nuts for parties, and now I don’t remember this recipe from Tartine. I’m running to look at the book again now. Thanks for inspiring me to grab that off the shelf!